Generate all the solar energy you need with the Portable Sunpower Semi-Flexible Solar Panels. Maybe bent for up to 3 cm to be mounted on curved surfaces. With a water-resistant surface, this solar panel can endure all weathers and charge all year round. Get your 100W 18V Semi-Flexible Solar Panels. Order It Here! Move to solar energy, save power consumption, and save money from your electric bills. These semi-flexible portable solar panels can be installed on majority of surfaces. Lightweight and durable, the solar kit has no aluminum or anything breakable, so you can position them even on small spots like condominium balcony, or an upper floor apartment. Bend the solar panels up to 3 cm, and then mount it on top of your car, van, RV, boat, yacht. You can also install the panels in your home, fence, tree, barn, or other irregular surfaces. High Efficiency – Uses the most efficient 25-30% solar cell to coat the flexible solar panels. It has excellent weak light sensitivity, making solar energy absorption and efficiency even higher. car, RV, sailboat, coach, yacht, van, truck, cabin, trailer, camper, tent, golf cart or any other application. 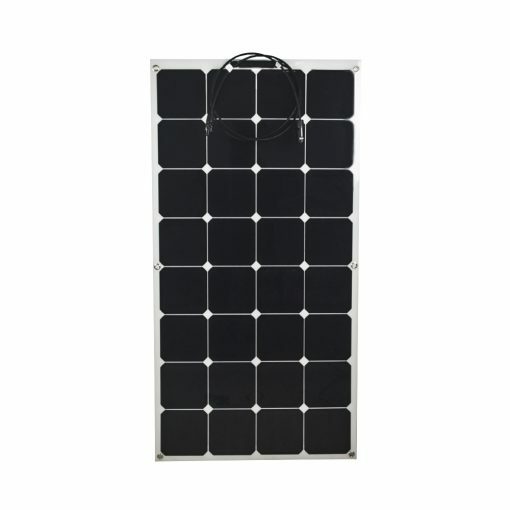 Light Weight – This 100watt monocrystalline solar panel only has around 0.15 inch thickness, weighing approximately 4 lbs., which is less than other heavy solar panels that weigh as much 30 Lbs, so it’s easier to carry anywhere. Weather Resistance – The solar panel with junction box can withstand rainwater, gust, snow, cold or hot, which makes it a highly adaptable solar panel in any environment and season. and other sticky adhesives, so you’ll be able to install without any expensive structural reinforcements. Go green and switch to solar energy now! Start investing in these semi-flexible portable solar panels that can be mounted on almost all kinds of surfaces. These portable solar panels are lightweight and thin, durable, and contains no aluminum or glass so they work even in crowded areas or tight places. The monocrystalline solar cell is made with advanced lamination as a thin waterproof bendable plastic sheet, so the panel can be gently flexed to follow any smooth curve of 30 degrees max, up to 3 cm, so it can be easily mounted on a car, house, tent, boat, coach roof, RV, cabin, motorhome, or other irregular surfaces. When you bend, apply gentle force when you install the solar panels. Slowly flex to the curve to avoid potential damage. Avoid overbending, twisting or bumping as this may damage the solar panel. and overheat. Do not put the solar, in partial shade and then in partial extreme sunlight, since this can short the junction. Avoid any rough handling, carrying, moving or transferring as this may damage the panels. You may need to use recommended fuse to add to the positive connection cables. With highly efficient mono solar cells, this 100W bendable solar module has the highest conversion of up to 25-30% which can charge all 12V batteries. Enjoy an all year round supply of solar energy with these weather-proof solar panels! Order your 100W 18V Semi-Flexible Solar Panels Here. Get It Now! Theres sunny days when I tested the past week, during the poor weather conditions, its not providing lot of current, but it has enough power to run an electric fan for two to three hours, without pulling the battery. I’d say I’m surprised by its performance even in poor light or no sunlight. it’s flexible to an extent- but it can be turn to a slightly curved surface or even suspend in grommet. It’s output cable wiring connection can be easily connected on the panel, mounting is easy and its flexible. This panel looks like a laminated polymer and notice that if it heats up in extreme heat, it seem to get hot. Something I notice that surprised me is when I placed cardboard on the panel, it actually still provided charged/power. So far, looks sturdy. I’m impressed on the construction, its light weight and I can carry it with both hands. It is good in over 20 days of camping use, working excellent and charges from sunrise to sunset in any light, though you’ll get the best charge in direct sunlight especially at noon, around 11am to 3pm. I adjust the angles as soon as the sun move to maximize the heat. To keep it clean, it helps a little to use a feather duster to remove dust. Decided to switch to solar and so far I’m satisfied. Enjoying a good supply of solar energy with weather proof solar panels in the summer. It has so far cut down expenses in electricity by 20%. I’ll get another in the next month. I got the package in good condition. Ordered two of this to bring down the power consumption I have using generators when going on trips and exorbitant electricity cost. I have modest expectations on anything solar since I know it depends on the sun and the weather. I’m using this as a backup or everytime I feel the sun is reallly hot. I ordered this to have a portable solar charge solution for my RV. I want a light solar panel to hang it on our front window when its parked. I’ve so far use it on the ground with a cable extension when it was shaded.